In authenticated encryption schemes, there are two techniques for handling long ciphertexts while working within the constraints of a low buffer size: Releasing unverified plaintext (RUP) or Producing intermediate tags (PIT). 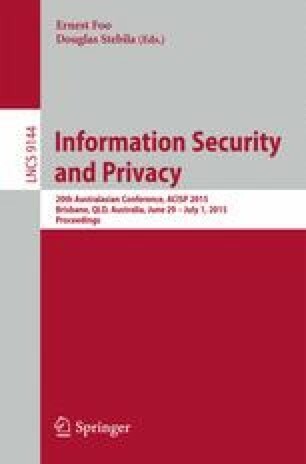 In this paper, in addition to these two techniques, we propose another way to handle a long ciphertext with a low buffer size by storing and releasing only one (generally, or only few) intermediate state, without releasing or storing any part of an unverified plaintext and without need of generating any intermediate tag. In this paper we explain this generalized technique using our new construction sp-AELM. sp-AELM is a sponge based authenticated encryption scheme that provides support for limited memory devices. We also provide its security proof for privacy and authenticity in an ideal permutation model, using a code based game playing framework. Furthermore, we also present two more variants of sp-AELM that serve the same purpose and are more efficient than sp-AELM. The ongoing CAESAR competition has 9 submissions which are based on the Sponge construction. We apply our generalized technique of storing single intermediate state to all these submissions, to determine their suitability with a devices having limited memory. Our findings show that only ASCON and one of the PRIMATE’s mode(namely GIBBON) satisify the limited memory constraint using this technique, while the remaining 8 schemes (namely, Artemia, ICEPOLE, Ketje, Keyak, NORX, \(\Pi \)-cipher, STRIBOB and two of the PRIMATEs mode: APE & HANUMAN) are not suitable for this scenario directly.